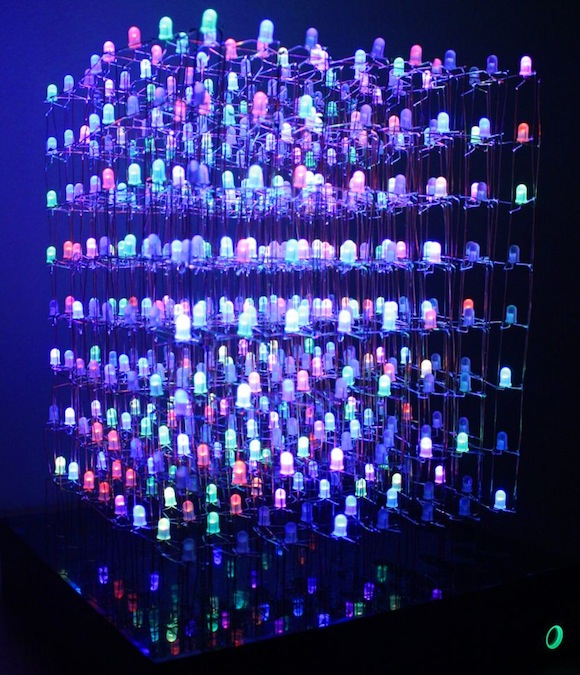 8x8x8 RGB LED cube controlled by Arduino #Arduino « Adafruit Industries – Makers, hackers, artists, designers and engineers! Check out this another 8x8x8 RGB LED cube controlled by Arduino. The 512 RGB LEDs are driven by 25 74HC595 shift registers using multiplexing. For those unfamiliar with LED cubes, they are simply a 3-dimensional array of LEDs that make for interesting displays. My project here is not the first RGB LED cube, nor is it the best, but I am documenting my process because while designing this cube I appreciated every resource on 8x8x8 RGB LED cubes I could find. My goals for this project were to create an 8x8x8 multicolor (RGB) LED cube cleanly. That is, with all the electronics contained neatly. Additionally, I wanted to use Arduino code to make it more accessible to others and for ease in upgrading. More on this later though. The hardest challenge was in making the LED frame straight and square. As with most things, quality depends on how much time you put into it. If I were to redo this project that would be the step I spend the most time trying to get right. Overall the project was rewarding in the end and I would say don’t be intimidated by the amount of work needed for design and assembly. The inventors of the giant 8x8x8 RGB LED cube were so transfixed on whether they could, that they never once stopped to ask themselves whether they should.